Towerless! This is one of the few racks available that allow you to store your wakeboards without needing a tower! Not everyone wants or needs a tower for their boat, but would still like the benefit of storing their gear safely out of the way. 99% of the other boat tower racks avaiilable are designed to clamp on to the legs of a tower rack, but this rack will let you store your gear without needing a huge tower! Made by Big Air, the Oasis wakeboard rack is a well engineered piece of equipment. An all billet aluminum construction means this rack is lightweight, strong, and most importantly rust-proof. Each rack is buit to hold two wakeboards and has an integrated bungee cord that will loop around your boards and hold them tightly in place. Between the rack's forks is thick and durable rubber padding that will prevent any unwated damage to your board or rack while it rests in your rack. This package includes two elements: the rack and a tubular bar. The rack attaches to the tubular bar and the bar attaches to the boat. The tube cross bar is 12" long but you will need 15" of unused space on your boat for mounting the bar. As you can see in the photos, a common place to but this cross bar is in the rear of the boat near the rub rails. There is an option to change the rack configuration to a combo rack that holds 1 wakeboard and 1 kneeboard. This is great if you need more storage options. We are very happy to be offering a towerless wakeboard rack to our customers. We highly recommend this rack and know you will be pleased with the quality! Looking for a great deal? Check out the Clearance Version of this rack at over 25% off! Space between wakeboard forks is 1.25"
Space between kneeboard forks is 4.43"
Is the stability is good when the boat is in motion? These towerless wakeboard racks are plenty sturdy. One key though, is to make sure the rack is securely anchored to your boat when you install the "rail" part that the racks clamp onto. That will help. You don't have the wakeboard and wake surfboard option....will the double wakeboard work with a wake surfboard in it? The two wakeboard combo won't work for most wakesurfs, as the forks only have a 1.25" gap, which isn't wide enough to hold most wake surfboards. Unfortunately, the manufacturer doesn't currently make a wakeboard/wakesurf option, they only have the options for two wakeboards, or a kneeboard/wakeboard combo. Some people will use the knee/wake option to hold their wakesurf, since the bungees generally holds them in place (the kneeboard forks have a larger gap of 4.43", though that is larger than most wakesurf forks that are usually around 2.25" wide). What size side rails can it attach to? 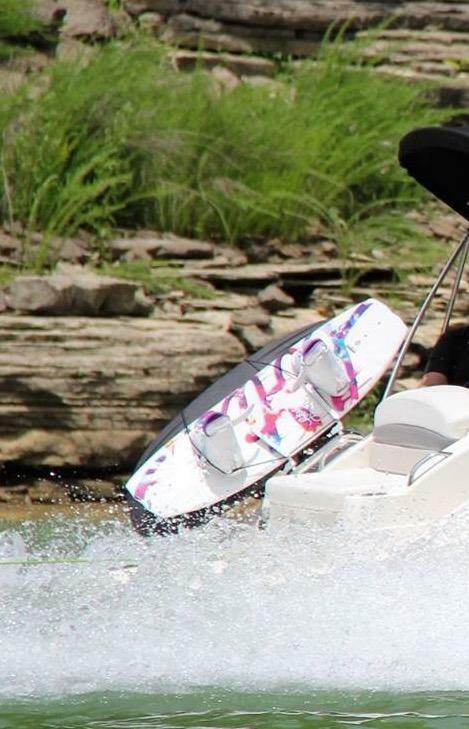 This towerless wakeboard rack does not actually attach to a boat's side rails. 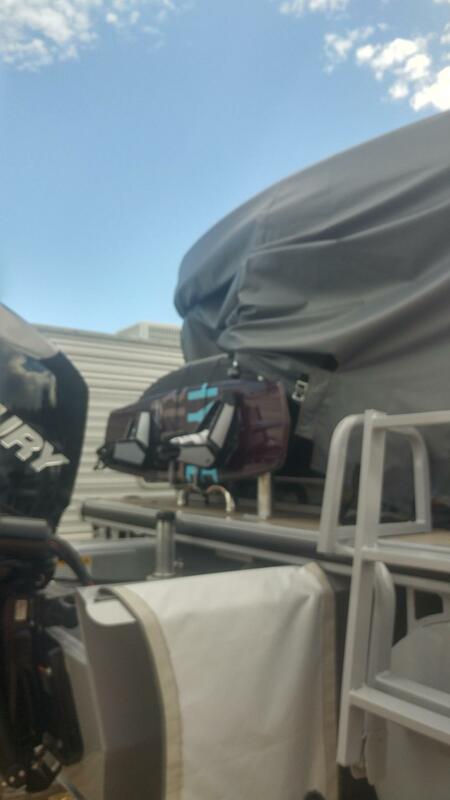 Instead, it comes complete as a crossbar that is mounted directly to your boat's fiberglass hull, along with a wakeboard rack that attaches to the crossbar. You can mount the crossbar to almost any location on your boat (bow, mid-ship or stern) though you will need to be able to access the hull in that spot, and it helps if it is a mostly flat area where you install the mounting plate. You also need to place the bar somewhere on your boat that has about 12" of clear space. Once that crossbar is installed, you attach the included wakeboard rack to it, and you are ready to go! can I use it on our pontoon rail? Our towerless wakeboard rack would not be recommended for a pontoon boat; it would not work to mount to the railing, and there really wouldn't be a way to properly mount it on your boat. How do the tubular bars get attached to the boat? Do they have to be bolted? Yes, our towerless wakeboard rack is attached to your boat by bolting it with the included hardware. 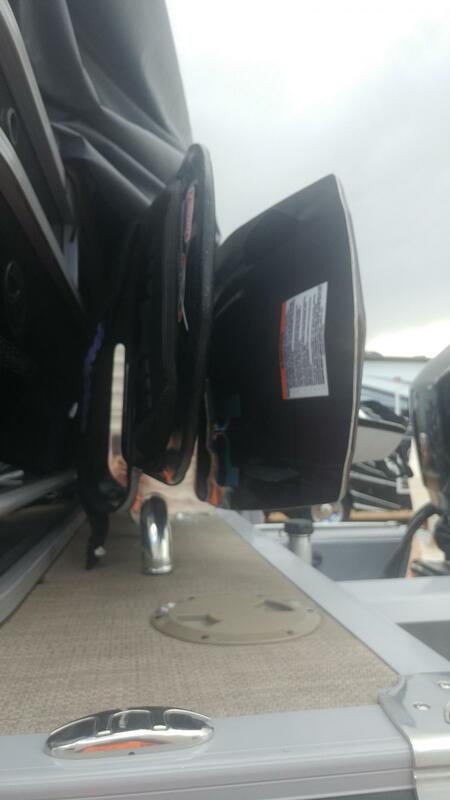 You can choose what area on your boat to install the rack, that can be horizontal or vertical, and it can be at any location on the boat (bow, mid-ship, or stern), but you will need to be able to access the inside of the hull to install the mounting hardware, and the area must be relatively flat. Also, the tubular bar is 12" long, which means you will need 12" of unused space on your boat where you will be mounting this bar. The mounting hardware and instructions are included; you can also find the instructions on our listing here: assembly instructions, if you want to check them out prior to purchase. How easy is it to remove the forks from the mounting bar so you can cover your boat? The Oasis Towerless Rack has wakeboard forks that can be easily removed with an allen wrench, by removing 2 bolts per clamp. Its not quite "quick release" -- but it is not hard and is doable. You would probably need to be careful not to drop the bolts in the water if you were covering your boat at a dock, say (and to keep the bolts with the rack for when you go to put it back on). From the pictures it looks like each fork is mounted on the tube/rail independently is that correct? Does that mean I can adjust the distance between the forks? What is the max separation I can get between the forks? Iam trying to see if I can adjust the kneeboard slots to also hold a slalom waterski. I think it will work if I can get the right separation between the forks. Yes, the forks for this wakeboard/kneeboard rack are two separate pieces that you can mount at a distance you choose from one another -- up to 12'' maximum apart, as the bar you attach them onto is a total of 12" long. As they aren't manufactured for slalom waterskis, we can't guarantee that use, but it could be doable if that gives you enough room to hold your waterski. Can your Towerless Wakeboard Rack | Big Air Oasis be used to hold skis? The Towerless Rack is, as you see, basically a tubular bar you attach to your boat. It includes the forks to hold wakeboards (or an option of a combo wakeboard-kneedboard rack). The forks are actually two separate pieces that can be mounted up to 12" apart; their gap, where a board normally sits, is 1.25" for the wakeboard forks, which is similar to the gap for some forks intended for holding waterskis, so could work, but you would have to gauge whether the forks could be placed at an adequate distance to hold the skis. Do you have a rack system like this that can be mounted on the side wall or floor of a pontoon boat? We don't have a bar like the towerless wakeboard rack that can be mounted to the sidewall or floor of a pontoon boat. Our only options for pontoon boats are some racks to hold SUPs or Kayaks that attach to the side of the pontoon boat. Can I install the rack without the crossbar on the towbar of my 2015 Bennington 20 SLX. I understand that it will not mount anywhere on the pontoon itself due to the lack of width on any railing. The Oasis Wakeboard rack consists of two independent forks (unlike most wakeboard tower racks, where the forks are joined by a singular piece that clamps to the tower). The mounting bar they normally attach to is 2" in diameter, so you would need to look at the diameter of your towbar. If your towbar is about 2" in diameter, these could possibly work for it. We can't guarantee it, but that would be something to look at, to gauge whether it might work for your Pontoon boat's towbar. One other note, these particular wakeboard forks cannot be purchased separately though, without the mounting bar. 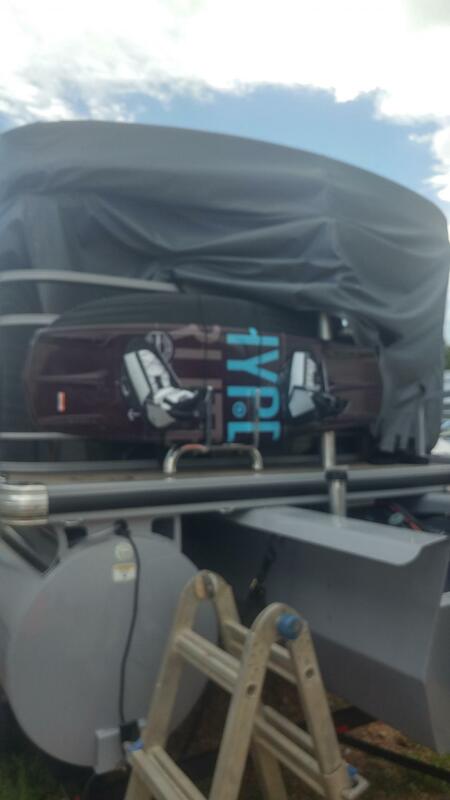 Is this wake board/knee board combo available in a rod holder option? There isn't a combo-rack available for fishing rod holders -- but this wakeboard rack for fishing rod holders can hold wakeboards, wakesurfs, waterskis or kneeboards, and it can hold up to a couple wakeboards. Does this come with all the necessary hardware to install on my boat? Yes, our Towerless Oasis Wakeboard Rack includes all necessary mounting hardware; you will need some tools of course to mount the rack (a drill). We have mounting instructions on our listing for this item, which can be checked out, so you know what is involved. Am I able to purchase an additional crossbar and what would be the cost? No, unfortunately on the Towerless Oasis Wakeboard Rack the crossbar itself is not sold separately at this time. Do you make a sup version? There are a few different types for different types of boats, and they either mount to rails/stanchions or to fishing rod holders, in case any of those might work for your boat! I am looking for a similar rack for a Pontoon Boat - is there one? We have a couple of wakeboard racks options that attach to fishing rod holders, found with these towerless wakeboard racks, but we don't have a wakeboard rack similar to the Oasis that attaches to pontoon boats. What width is needed to mount the mounting bar i.e. I see that the bar is two inches around, but is more width needed? Kinda like the bar is 12 inches long but 15 is needed for mounting. For the Towerless Oasis Wakeboard Rack, the tubular bar has two 2" diameter mounting plates - so you need a surface on your boat that can be horizontal or vertical, and should be relatively "flat" to accommodate the 2'" plate (though some curvature is allowed), and you will need to make sure there is access to the inside of your hull to mount the hardware, and that it is clear of wires, fuel lines, etc. Other than those instructions, an extra width amount is not required, as it is for the length of the rack. Can the wakeboad holder rotate easily for storage, to allow my current cover to fit? It looks like the forks would preclude use of my cover. I mounted my rack in a vertical position on the back of my 2017 Recency pontoon boat deck. It works AWESOME!! YES we wake board behind a pontoon boat. Guess you can do that when you have 250hp super charged mercury verado motor. Anyway this was a perfect addition. I hated having to bungee to the fence rails. Thanks a million this is an awesome rack it holds our boards perfectly!! I really liked this product. It has been working great. Easy install as long as there is adequate access. We changed out the Allen head bolts for hex head due to difficulty tightening. Not a good idea with the Allen heads if space is minimal. Easy install. Pretty sturdy. Had to tighten bolts excessively to ensure it didn't bounce with wakeboards in it. Bolts used to secure rack to bar stripped out the first time I tried to make an adjustment. Poor quality bolts. The quality of the product was excellent and the installation instructions were easy to follow. Took the boat out and the rack worked great. Easy ordering, easy install , does what it said it would do. Written by: A gene S.
Easy to install on my 2008 Chaparrel Sunesta. Looks good too! So far, looks good . . . Installation was relatively simple. The rack looks great and appears to be very sturdy. I can't speak to how it actually works in process because its still early in the season here and we haven't had the boat out yet. So far everything is as advertized. Hopefully that continues once we get to the actual use. Exactly as described. Instructions were spot on. Installation was a breeze. Rack was exactly as described top quality and finish. It will add a unique look to my boat and function perfectly for what I was needing. I love the fact that I now have the same storage as a person with a tower without the expense and I like the clean look of boats without a tower plus no obstructions created. I needed an alternative to wide wing type wakeboard racks that stuck out the side of my boat. This rack solved the problem, mounted to the back angle of my boat gave me the storage for 2 boards while on the water and didn't have to sacrifice floor space or looks. Actually I think it accents the boat and is very good quality. I really like this product. Easy to install and works great, the only issue is I have to tighten it back down to the boat after every time the boat is on the water. Not a big deal though. The installation was a breeze . The installation instructions were clear and easy.